Washington DC — A good education for every child is an urgent global imperative, but what if entering schools puts children at serious health risks? Tuberculosis (TB), the single biggest infectious disease killer, poses a major risk for young people in countries with high prevalence of TB, and schools are among the places where they are most likely to catch it. 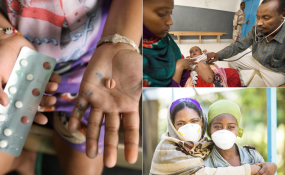 The United Nations, which commemorates World TB Day on March 24, continues to raise public awareness about the global epidemic, and pursues efforts to eliminate the disease. Tuberculosis is spread when a person with the active disease is coughing or speaking and expelling tiny droplets containing the live bacteria. In a school setting, a student, teacher or other person in the school with TB can unwittingly spread the disease. The microscopic droplets can remain suspended in the air for extended periods, 30 minutes or more. Globally, 67 million children are estimated to have TB infection. For children under five years of age, the greatest risk is in the home where they usually catch the infection from family members. Infants under one year of age are at especially high risk to develop TB disease, including severe, life-threatening forms, if they have been infected with the bacteria that causes it. But, for older children, the picture changes dramatically with the greatest risk of infection being outside the home, particularly in overcrowded, poorly ventilated places - like schools. In South Africa, where TB kills even more people than HIV/AIDS, a 2014 study found that adolescents faced a 14 percent chance over one year of acquiring TB infection, which investigators termed "extremely high." By adolescence, more than half of the children in South Africa are already infected with TB, and given the rate of drug resistance, some would have a resistant infection. According to another recent study, up to half of TB transmission in young adults in South Africa age 15-19 is occurring in schools, in part due to the high proportion of "re-breathed air" in such settings. The study concluded that schools were a "particularly high-risk environment for transmission among young adults." A comparable investigation in Tanzania found an annual risk of TB infection in schools of 4 percent, lower than in South Africa, though still high. The study attributed the difference to the warm climate of Tanzania where schools rely on open windows and are better ventilated compared to South Africa. Each day about 28,000 people across the globe develop TB disease, when the infection becomes active. Though curable, it has devastating consequences for them and their families, including frequent debt, job loss and impoverishment. On average, 5-10 percent of those who are infected will develop active TB disease over their lifetime. Typical risk factors include undernutrition, diabetes, alcohol abuse, and smoking, and when a woman becomes pregnant her chance of developing TB disease doubles. However, when children enter late adolescence their risk rises far above average. For the age group 15-19 the rate of developing active TB, as well as the mortality rate, is approximately double that of 10-15-year olds, according to the Global Burden of Disease Study 2015, published in Lancet Infectious Diseases, March 2018. The first-ever estimate of active TB among young people, across all regions, was published in 2018 According to the estimate, 1.78 million adolescents and young adults aged 10-24 years developed tuberculosis in 2012, with the largest numbers in South East Asia and Africa. The authors noted the marked increase in TB between early adolescence and young adulthood, and urged attention to the special needs of this vulnerable population. Adolescents living with HIV are up to 27 times more vulnerable to TB. However, TB risk extends to all young people. A study in western Kenya found a very high rate of active TB among adolescents, aged 12-18, most attending school and most HIV negative. Urgent action is needed to address this health crisis impacting young people. First, active steps must be taken to find and provide person-centered treatment to everyone with active TB disease, including in school settings, along with psychosocial support. Once on the correct treatment a person with TB rapidly becomes un-infectious. Third, improving ventilation and reducing overcrowding in school settings - and in any indoor environment in high TB burden countries where people, of any age, spend large amounts of time together - is s critically important. This applies not only to schools but also places such as clinic waiting rooms, places of worship, prisons, and public transport. Fourth, we must raise TB awareness, since knowledge of the disease is low, even in high burden countries. In this and in many other areas, South Africa has been leading the way forward. With support from the US Agency for International Development (USAID), the Department of Education is providing training of teachers and learners to be TB ambassadors, carrying out community activations and media campaigns focused on TB in children, and conducting TB screening. Finally, governments must do more to establish adolescent-accessible health services, to meet the special needs of this group, including their vulnerability to TB infection and disease, as well as to other risks such as HIV. Addressing TB among this group will require breaking the silence and confronting the stigma, shame and myths that have slowed the response. We must not delay. In Africa, 41 percent of the population is under 15, with a further 19 percent between the ages of 15 and 24. In India, 300 million people are under the age of 15. We will fail these and many other young people if we ignore tuberculosis.